We are all familiar with Pineapple Upside Down Cake, but I want to show you a fabulous variation of that wonderful desert that uses strawberries instead of pineapple. This is an extremely easy recipe that you could easily throw together in a few minutes, bake it for 50 minutes and have the perfect Valentine's Day cake for your sweetheart. This Strawberry Upside Down Cake Recipe calls for for only 3 simple ingredients in addition to the fresh strawberries. 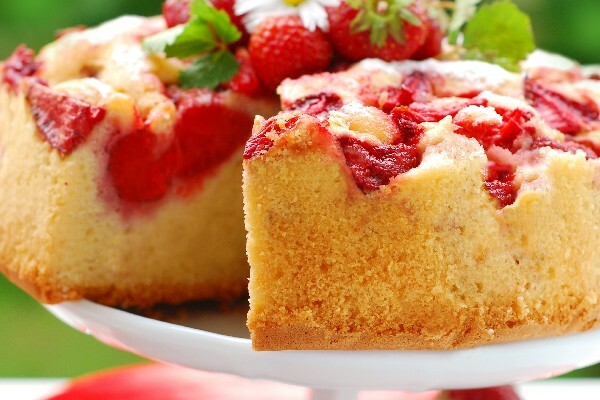 When you see the recipe, you will be very surprised to discover that this Strawberry Upside Down Cake is made with a store purchased box cake mix, marshmallows, gelatin and the strawberries. It does have to bake for 50 minutes and cool for at least 1 hr., but the prep will be fast and easy. Let me note however, the photo of the Strawberry Upside Down Cake shows a round cake. The recipe calls for a 9 x 13 baking pan. In order to get the round cake as shown, I would recommend using a non-stick springform pan like the one shown below. If you use the springform pan, do not release the side until the cake is completely cool. This will take at least 2 hrs. Also, this cake mixture is very runny. It is not like a cheesecake. You will need to put some type of protector like a thin cookie tray under the springform pan to protect the bottom of your oven. For step by step instructions, visit Kitchme and start baking this delicious cake today!